A beautiful set of 20 Aember tokens for the game Keyforge by Fantasy Flight Games. 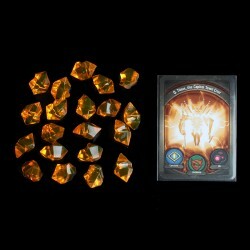 These tokens look like real crystals being made from a high quality clear acrylic material which is safe and non-toxic. The KeyForge card in the photo is only included for scale and is not included with the tokens.